Not only do De La Mer Day Spa's autumn offers read like a teahouse menu they also take place on a floatation bed that offers the chance to catch up on missed sleep too! Choose a Jasmine, Frangipani & Coconut Moisture Melt Wrap or a Coconut, Green Tea and Coffee Detoxifying Wrap, and experience the benefits and tranquility of dry floatation. Dry Floatation is a deeply relaxing body treatment that allows you to experience weightless relaxation without getting wet! The treatment bed is a mattress filled with warm water that helps the skin absorb any oils or wraps applied more effectively.A natural state of complete relaxation, Dry Floatation significantly enhances physical and mental wellbeing and has the same benefits as several hours of quality sleep. Benefits: Gentle exfoliation, jasmine stimulates the senses, coconut softens and nourishes the skin. Benefits: Green Tea is an anti-oxidant, coconut adds extra moisture that our body needs black coffee detoxifies and is good for cellulite. 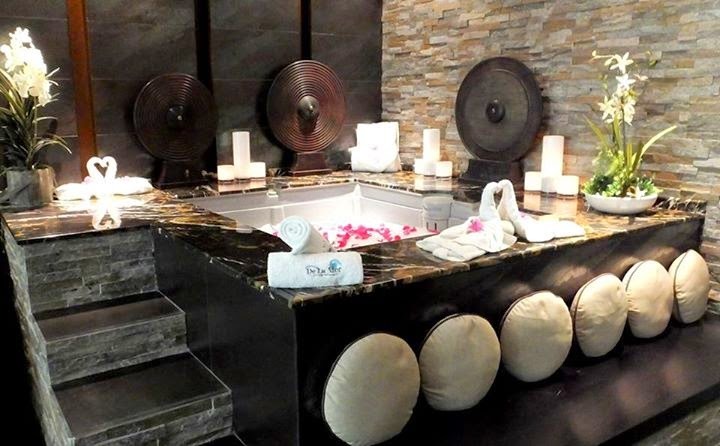 Both treatments begin with a body brush to remove dead skin followed by the application of the wrap and a head massage before being lowered into the floatation bed for 30 minutes.After a shower, frangipani oil is applied for the Moisture Melt Wrap and cellulite cream is applied for the Detoxifying Wrap.Total bliss! Offers are available throughout September and October 2104.